Fourth Row Center: Film Writings by Jason Bailey: #TribecaFest Review: "God Bless Ozzy Osbourne"
#TribecaFest Review: "God Bless Ozzy Osbourne"
Near the opening of God Bless Ozzy Osbourne, the new documentary from Mike Fleiss and Mike Piscitelli, the film’s subject celebrates his 60th birthday. “I shoulda died hundred times,” he says, and based the evidence that follows, he’s absolutely correct. Here is a man who spent the better part of his life incapacitated; he destroyed his first family and nearly did the same to his second, to say nothing of himself. That he’s still ticking is something close to a miracle, or at the least, very good luck. God Bless Ozzy Osbourne is propelled almost entirely by our fascination with his peculiar personality—with how funny he is, how ballsy he was, and (to no small degree) how tragic he is now. It tells his story in a pretty standard, VH1 Behind The Music style—in fact, there is some question as to why it even needed to be made, since that program covered most of the same territory with about the same depth. That is the first problem. The second problem is that the filmmakers want to have it both ways with their subject. For much of the picture’s running time, it is a celebration of his hedonism, filled with breathless tales of excess—cocaine in cereal boxes, hotel room destruction, alcohol-induced blackouts. We’re struck, in the first hour, by how many people are willing to make excuses for his behavior (particularly wife and manager Sharon); only occasionally do the contrarian voices, like his first two kids, come through. “When he was around and wasn’t pissed, he was a great father,” his son says, though that wasn’t too often. His first daughter harbors similar ill will; when Ozzy is asked (now, keep in mind) when she was born, Ozzy stammers, “’71, ’72… I’ll find out for you.” But then that moment passes, and it’s time for another montage of his wacky shenanigans. The film only develops a point-of-view about his vices when he talks about finally getting clean, over the last five years. And that’s all good stuff, and admirable; there’s an emotional truth to the closing passages, and you’re happy for him (not to mention those around him). But what are we to make of all the material beforehand? It’s not that the stories aren’t entertaining; few tales in rock have been told as frequently as that dove-biting and bat-biting incidents, and they still play. But nothing new is brought to us here. We’ve already heard Ozzy’s story—and we had already heard it before we heard it from him. It’s the classic rock arc: up from nothing, huge success, drugs and drink, occasional tragedies, stumbles and comebacks, supportive family, happiness at last. Much of it is fun to watch—the old clips are exciting, particularly the wonderfully laughable excess of those early ‘80s performances—and the filmmakers will occasionally do something interesting, like having Ozzy watch a disc of his old music videos (he doesn’t remember making them, but certainly doesn’t enjoy them now). But those moments are few and far between. More often than not, Fleiss and Piscitelli trot out the old star-profile-documentary warhorses; if I have to watch one more celebrity drive around his hometown and visit his childhood home, I’m going up to the booth and setting the print on fire. We’ve been there; we’ve done this. The film was produced by Ozzy’s son Jack, and that kind of connection can result in either a) full access for a penetrating and thoughtful portrait, or b) a puff piece. The trouble with God Bless Ozzy Osbourne is that it thinks it’s the first when it’s clearly the second. 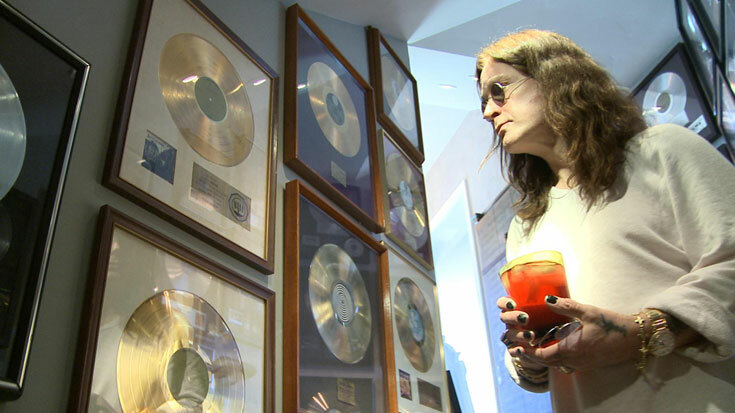 "God Bless Ozzy Osbourne" premiered Sunday night at the Tribeca Film Festival. It screens again on Thursday 4/28 and Saturday 4/30. This is my 1,000th post. #TribecaFest Review: "Love Always, Carolyn"
#TribecaFest Review: "Everything Must Go"
#TribecaFest Review: "The Last Rites of Joe May"
#TribecaFest Review: "Stuck Between Stations"